There was a study recently which presented evidence that parents — American parents in particular — lead unhappier lives than their non-parental peers. It came to mind this morning as I was straining to convince Wilder not to put his sister’s My Little Pony in the toilet and instead rejoin one or both of the half-eaten bananas sitting on the counter. There’s probably a lot of truth to the study but I’ve found that parenting comes with some benefits: moments of absolute transcendence, fleeting but real, where everything feels right. I have yet to find another pursuit that provides this feeling. 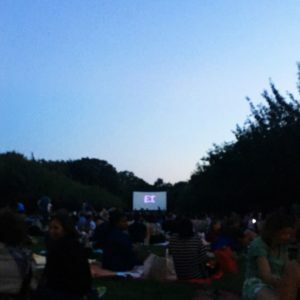 Wednesday night, Charlotte and I settled in for movie night at the Botanic Garden. E.T. was playing. You could not have designed a better night: cool, just a touch of late summer humidity in the air. The smell of OFF and the sound of bottles hissing open. Fireflies, then dark. As the kids mounted their bikes and took off across the face of the moon, a light breeze kicked up over the lawn. C was sitting on my lap. I buried my face on the top of her head, shut my eyes, and held her closer while she watched the magic unfold on-screen. I choked up; John Williams’ score swelled. It lasted maybe five seconds before the breeze moved on. We were on to the next part.